Guaranteed Long Lasting Protection For Your Investment. Protecting your vehicle from new is the most effective way of retaining its cosmetic appearance for as long as possible whilst preserving its resale value. Whilst many car dealerships offer paint protection packages, typically, they do not have the time, the equipment or the knowledge to properly prepare a vehicle prior to applying the coating. Consequently, the results can be disappointing, with contamination and paintwork blemishes permanently sealed beneath. Guaranteed for up to 60,000 miles, UF Studio’s New Car Protection Service is carried out by highly trained professional detailers who draw on a wealth of experience to ensure your vehicle receives the best possible treatment. Only the most modern and innovative ceramic coatings are used to ensure your vehicle’s paintwork is protected against environmental elements such as UV, acid rain etch and bird droppings, as well as offering swirl resistance, hydrophobicity and imperviousness to extremes of pH. Standard: Gtechniq Crystal Serum Light or Kamikaze Collection Miyabi Coat offering swirl resistance and protection against chemicals, dirt, salts and oils. Durability guaranteed for 12,000 miles*. Pro (Single Layer): Gtechniq Crystal Serum Ultra or Kamikaze Collection Zipang Coat offering protection against chemicals, dirt, salts and oils, plus increased resistance to swirls and scratches. Durability guaranteed for 24,000 miles*. Pro+ (Dual Layer): Gtechniq Crystal Serum Ultra Black or Kamikaze Collection Miyabi Coat and Zipang Coat for increased protection and enhanced hydrophobic properties. Durability guaranteed for 36,000 miles*. Ultra (2-Stage): Kamikaze Collection ENREI a state of the art 2-stage sealant for the ultimate in protection and gloss whilst further increasing hydrophobic properties. Durability guaranteed for 60,000 miles*. 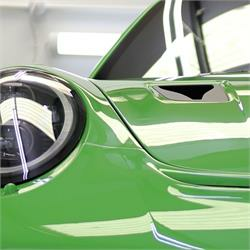 Read more about the Gtechniq and Kamikaze Collection sealants used at UF Studio. Group A: e.g. Fiat 500, Smart, Toyota Aygo etc. Group B: e.g. BMW 3/5 Series, Audi A4, Porsche 911, Ferrari 458 etc. Group C: e.g. BMW 6/7 Series, Audi A8, Range Rover Evoque etc. Group D: e.g. BMW 8 Series, Audi Q7, Rolls Royce etc. *Please refer to terms and conditions of guarantee here. Just saw that you uploaded my car to the website. Wanted to say thank you and how pleased I am with the results. Now saving up for treatments to my other cars. Thanks again. Picked your company because of better delivery options.